The Day of the Dead is a time to celebrate those who have come before us, and what better way to do it than to wear colorful clothing and represent their death with sugar skulls? There is no better way! These traditions go back generations and we wouldn’t want to go against traditions, would we? Do you want to know a for sure way to honor the dead? Look your best of course! Suit up in this Men's Day of the Dead Costume. Sugar skulls are used to pay tribute to past loved ones during this Mexican holiday. Have fun celebrating this special occasion with this beautiful costume. 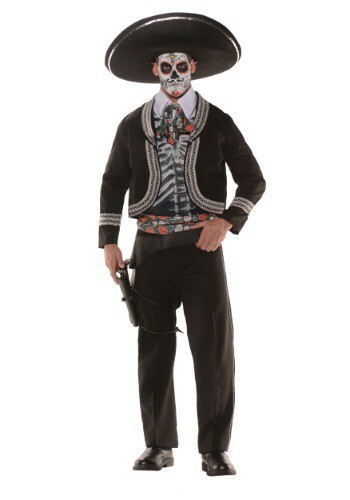 You’ll be dressed to the nines in this men’s Day of the Dead costume. It comes with everything you need to get ready for a parade or for Halloween (or both!). The cropped jacket has sewn-in foam vest panels to help it keep its shape all night long. The foam vest panels have printed rib bones and they fasten with Velcro behind decorative buttons. The matching pants have an elastic waist that make for a comfortable fit all night long. The included shirt front fastens with Velcro at the back of the collar and has an attached skull and flower print bowtie. Become the king of the night with the included skull and flower print sash that measures 72” long and 4” wide.